For the second year in a row, STS Aviation Group will be taking off for Columbus, Ohio to exhibit at the 2018 DLA Land and Maritime Supplier Conference & Exposition. The DLA Land and Maritime Supplier Conference & Exposition is a two-day event hosted by the National Defense Industrial Association (NDIA) and DLA Land and Maritime to provide a forum for current and potential vendors to discuss future logistics support strategies, challenges and to streamline efforts to better support the Warfighter, states the conference website. This year’s theme is “Improving Warfighter Readiness by Improving Industry Alliances and Reforming Business Processes”. DLA’s business model is evolving from a primarily transactional model to one that values long-term relationships. To help advance this evolution, DLA is executing an active Industry Engagement Plan that fosters innovation through research and development. Improving Alliances and Reforming Business Processes expands opportunities for all businesses, invites smarter and innovative ways of doing business and creates greater synergies with service partners. 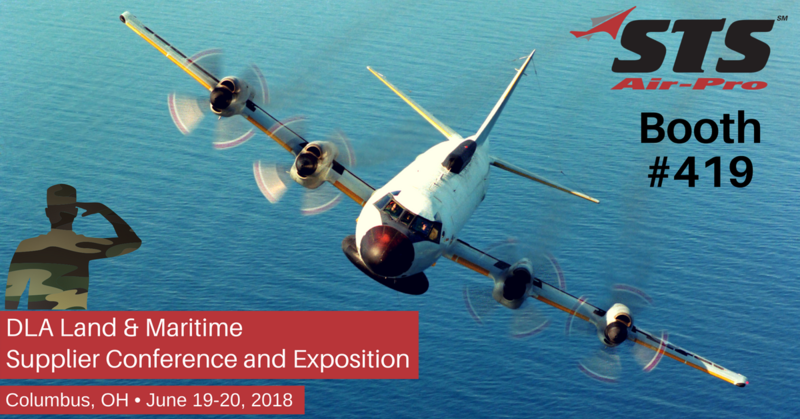 At this event you can expect keynote addresses with topics such as Air Force Electronics, Maritime Systems and Land Systems, and many more! There will also be various networking breaks and breakout sessions throughout the two day conference. Click here to view the complete agenda. Senior Manager of Military & Technical Sales of STS Air-Pro, David Burgett, will be representing STS during this conference. Remember to fly by Booth #419 to learn more about our many service and support capabilities for military applications and the defense industry. We really look forward to seeing you all in Columbus!